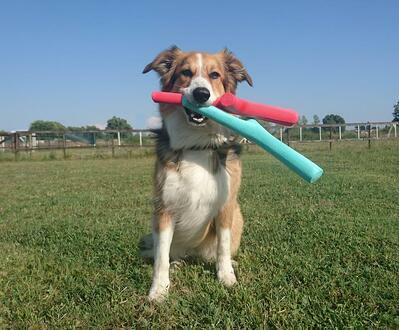 A Safe PlayStick Dogs Love! We set out on a mission to find a great fetch toy. It had to be lots of fun, dogs had to love it, it had to be durable, and it had to be very safe (non-toxic, splinter free, etc). Well, we did it — we found one and we know you’re going to love it. Best of all, this fetch toy actually looks like a stick! 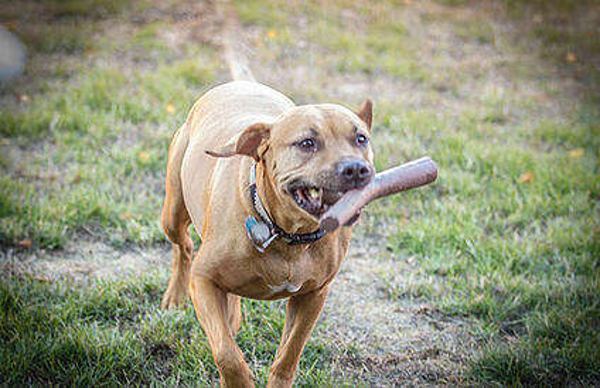 It’s soft enough to not hurt your dog’s teeth but it’s durable enough for a quick post-fetch chew. It’s heavy enough that you can throw it pretty far but it’s light enough that it floats in water — how fun! Now you know, at Preventive Vet, we’re all about safety so this thing had to be a super safe fetch toy. It should go without saying that it’s completely non-toxic and free from BPA, PVC, phthalate, melamine, lead, chromium, and a whole bunch of other chemicals you don’t want in your dog’s mouth! So if you want something that your dog will absolutely LOVE we encourage you to give this a throw. Running and swimming are wonderful ways to exercise your dog — and there’s nothing more heartwarming than a dog that is curled up, snoozing’, snorin’ and twitching away after some healthy exercise! Fun in water: It floats! 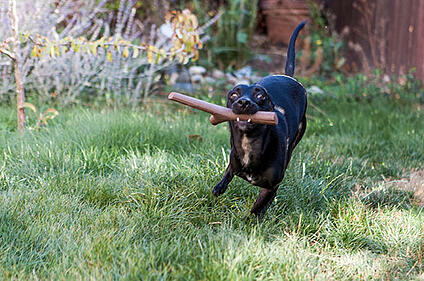 Non-toxic material: The fetch stick is made from resin (a thermoplastic rubber material). It is certified non-toxic and is completely recyclable. These compounds, that are toxic to dogs, are *not* in this toy: PVC, BPA, Phthalates, Lead, Cadmimum, Chromimum, Melamine, Arsenic, Bromine. 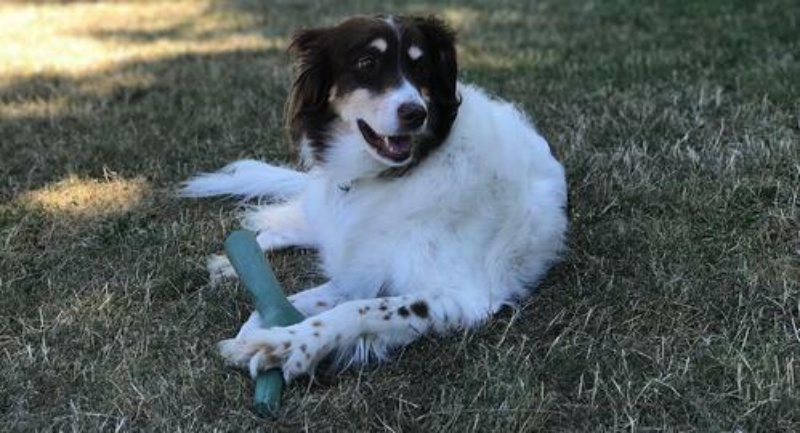 There are a ton of fetch toys, balls, and other doggie doo-dads in the marketplace, but this playstick was the highest quality that we've found and we're excited to make it available to you. Preventive Vet is the only place in North America where you can buy this dog toy. Please note: This is not meant to be an unsupervised chew toy, but it'll stand up to a bit of "post retrieval" chewing, and it's very durable for a game of tug of war. Dogs love it! We've just added two new great color options, Coral Red and Teal Blue. These bright colors are particularly good for making it easier to find your fetch toy in highly wooded areas, in the water, dimly lit places, or at a large park. Indy loves it so much, he plays with two at the same time! 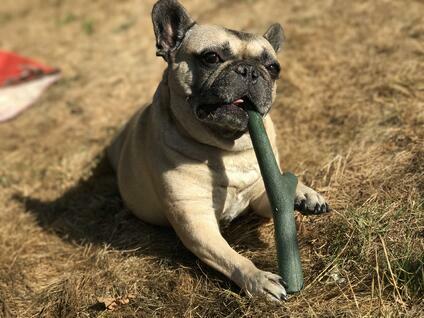 My Frenchie, Marshall Jolie-Pitt, loves to play fetch, but he's never gone after sticks so I didn't know if he'd be interested. From the second I opened the packaging, he was pretty much obsessed. The small size was easy for me to throw, and perfect for him to retrieve. When he was finished playing, he didn't let go of his new toy, instead he layed on the dry grass and started chewing. Like almost all dogs in the bully breed family, my little man is a heavy chewer and tests the durability of everything, and this was no different. The way he was gnawing and pulling, I was shocked that nothing came off the stick right away. Eventually, he was able to work off a very tiny piece, and I knew that if I let him continue, there could have eventually been tiny pieces everywhere. So, this won't be a chew toy for him, but he gets excited every time I pick it up and immediately runs to the door. It's his new favorite toy, and I've actually really enjoyed throwing it to him— especially since it's so easy to clean. My dog, Leander, is a really weird dude. He typically only likes two things: his stuffed animals, and sleeping under the covers until noon. He's not much of a chewer and never really gets into fetch. It took a little coaxing, but after a few minutes, I had him running in the yard like a madman. He's reeeeally into his new toy. 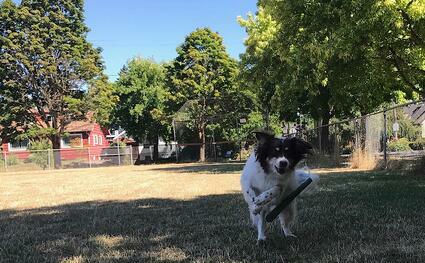 Wendy isn't much of a stick chaser or chewer, so I was surprised to see her enthusiasm when I brought this awesome fetch toy out for a test run. I'm no pro quarterback, but I was able to get some distance with this toy, and get it to go where I intended (for the most part). It's been a great addition to our play time routine. Jackson loves to play, and he loves to chew. When I first threw his new toy, we had a group of people over at the house and he ran all around the yard and all through the house like he was showing off. He didn't even want to share it with us to throw it to him at first. When we finally did get it in our hands, he kept bringing it back to a different person every time. I guess he wanted to test everyone's throw. He loved it. He did end up taking a break and wanted to chew on it. Knowing that he's a power chewer, I put it away out of reach. We'll stick to playing fetch and won't let him have it to feast on. Loki's a lover. He's gentle with his toys and he's an avid fetcher, and very particular about what he'll "bring back." In a sea of thrown fetch toys at a busy dog park, he'll only chase after and bring back what's his. Good boy!! 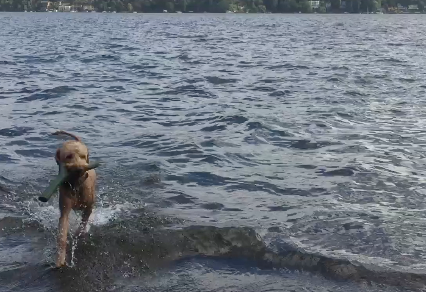 This quality makes him especially good at retrieving in the water. He zones in on the target and away he goes, retrieving it every time. He'd come out of the water and drop the "stick," asking for another round, and another, and another. He's not a stick chewer so this stick only gets "air time" as a fetch toy. 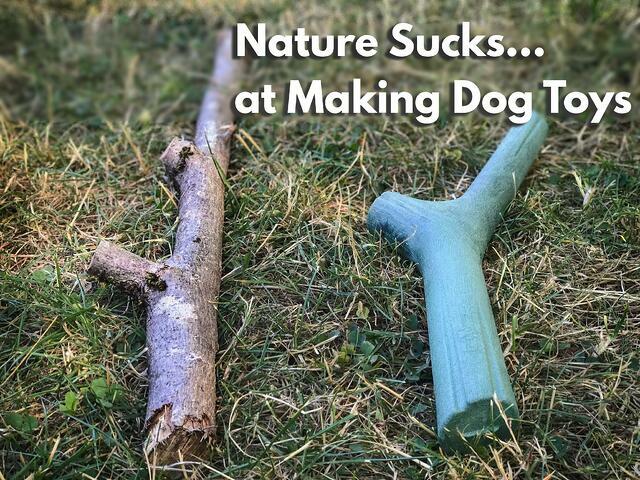 When nature gave dogs the stick, it gave them what is maybe the most dangerous “toy” anyone could have made. Most dogs love sticks, and most people are happy to throw a stick for an eager pup. The only problem is… well, pretty much everything about a stick is a problem. Heart, lung, liver, and other organ damage from running onto and being impaled by a stick (this actually happens more often than you might be aware).